24 Comments	This post may contain affiliate links. 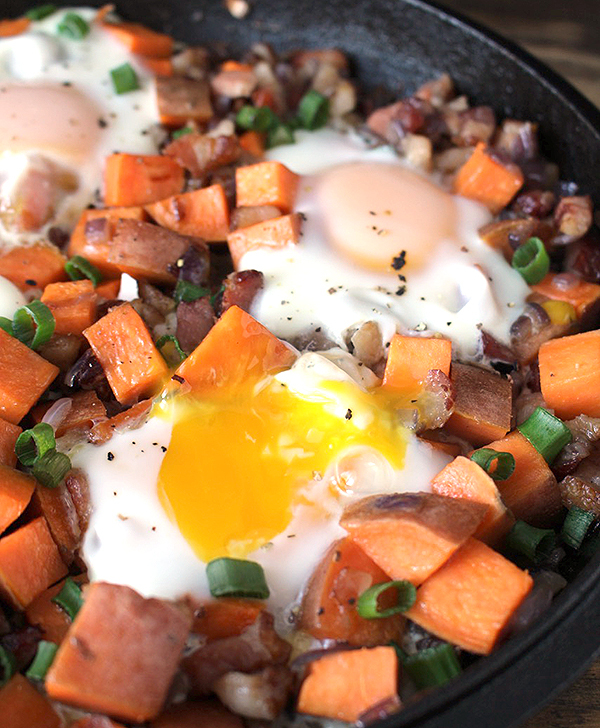 This Paleo Sweet Potato Hash has only 4 ingredients, but is loaded with flavor! Easy, delicious, and healthy! Whole30, gluten free, dairy free, and a great way to start the day! 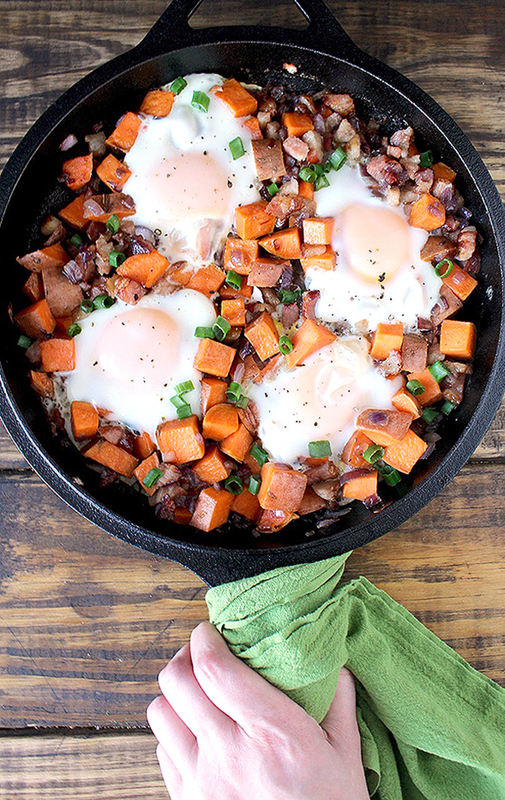 This is one of our favorite breakfasts to make. It is simple and so satisfying! I’m guessing that you have all the ingredients in your house already to make it. I know I always keep these items on hand. The sweet potato needs to be cooked since it won’t be in the pan long enough to cook from raw. I like to make mine a day ahead, just baked for an hour in the oven. 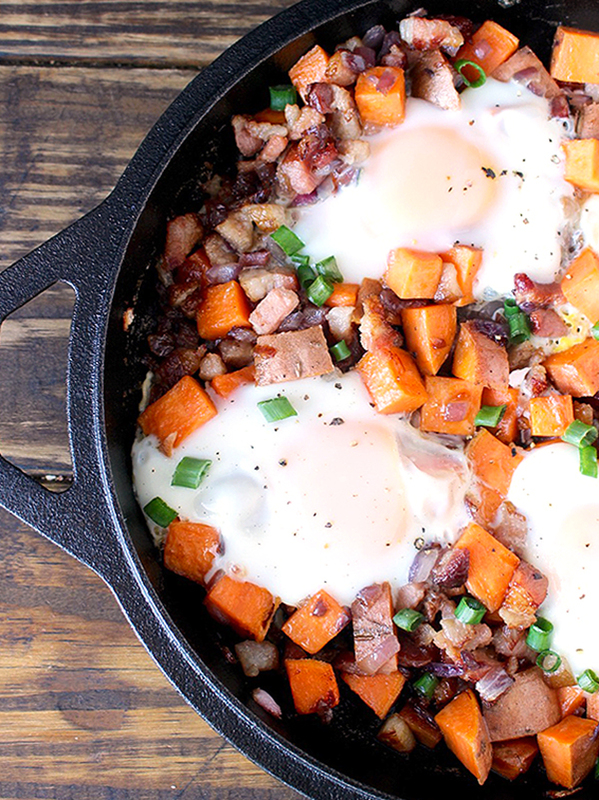 You could even bake a few potatoes and eat this skillet all week. The bacon needs to be cut small in order to get crispy and I find that scissors work best for this. Just chop into little pieces as even as possible. I usually bake my bacon, this is the one exception I make. Cooking the bacon first means no other fat is needed. Everything is just cooked in the bacon fat making it extra delicious!! Eating it straight from the skillet is highly recommended! Just be careful not to burn yourself on the pan! The runny yolk is my husband’s favorite part. Or maybe it’s the bacon. I’m pretty sure it’s both! This skillet serves two, but I suppose you could add a couple more eggs and have it feed more. 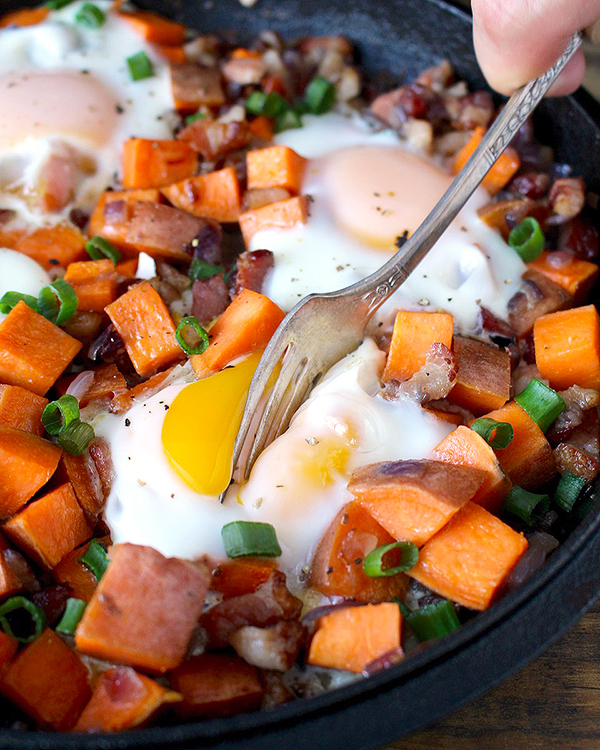 I love that it’s an all-in-one breakfast, no sides needed! You have your carbs, protein, fat, and so much flavor!! 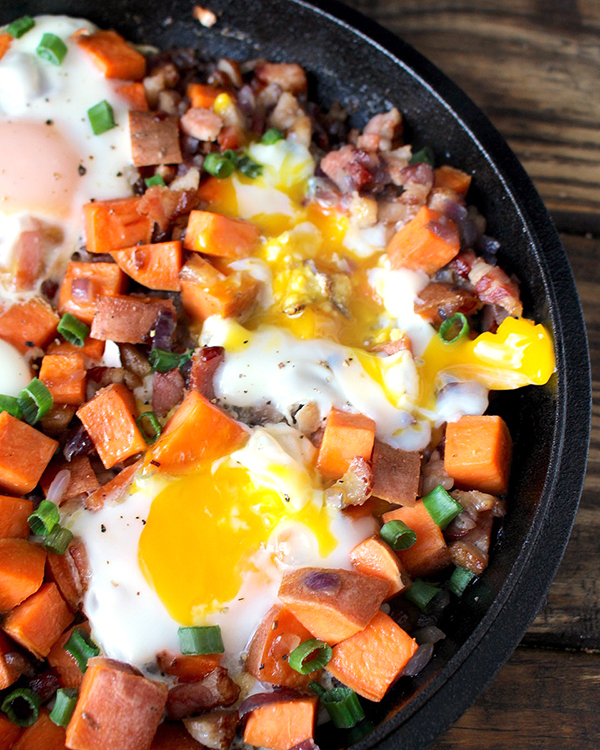 The crispy salty bacon, soft onion, the slight sweetness from the sweet potato and the runny egg make for the perfect bite! You’ll be hooked once you try it! You will also love how easy it is. In a 10 inch skillet (I love cast iron) over medium heat, cook the bacon until crispy. Add the onion and cook until softened- about 5 minutes. Add the sweet potato and cook for another 5 minutes until the potato is warmed through. Make 4 little spaces in the mixture and crack an egg into each one. Cover and continue to cook until desired doneness. About 5-7 minutes for eggs that are still runny. Sprinkle a little salt and pepper over each egg. Serve straight from the skillet. This recipe is simply amazing!! I make it all the time. It’s easy, delicious, and super filling.